Remember also that the drug makers are interested in smoothing-out the “roller-coaster” effect they suffered when their old blockbuster drugs went off-patent. Regardless of how profitable the new biologics turn out to be, makers still face the same problem once their original market exclusivity runs out: How can they protect their pricing power if new competitors are free to enter their market space? With this in mind, one of the great advantages of biologic drugs from the manufacturer’s perspective is that biologics are comparatively large, complex molecules, with equally complex production processes.3 This complexity make biologics perfect for employing patent law to make it as difficult as possible for potential competitors, with potentially far-reaching economic consequences for those who pay for these treatments. This article will explore what happens when traditional drugs reach the end of their exclusivity period. Then we will compare that process to what we see happening as the first biologic drugs approach the end of their own exclusivity. What happens when drug patents expire? Since the Hatch-Waxman law went into effect, the transition from a traditional branded drug to a generic drug has been fairly straightforward. If it is a popular, big-selling drug, often many generic makers will apply for FDA approval for their generic products. 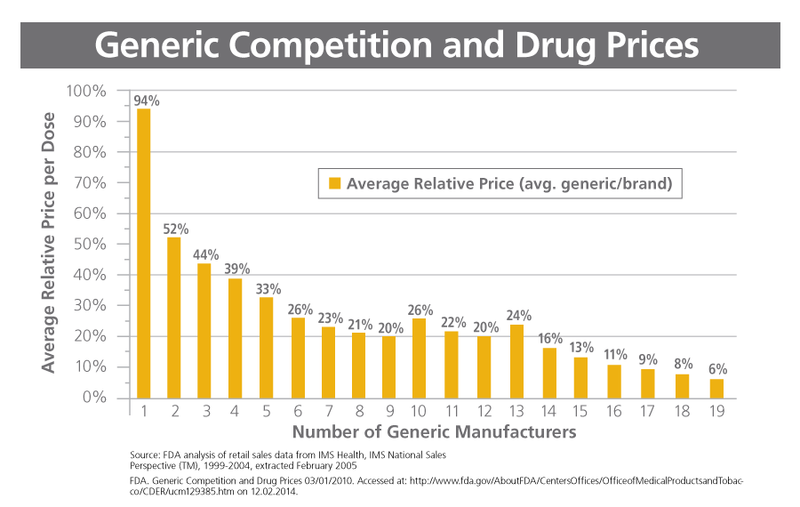 As we’ve learned, a surge of competition featuring up around 10 generic makers is the trigger that sends profits plunging by up to 90% for traditional drugs facing generics.4 This is the sales roller-coaster that we discussed in our previous article. We will see how cost, in particular, could make a big difference in the number of drug makers who participate in the new biosimilars market, which will affect how competitive that market in, or is not. Fostering a healthy competitive climate for biologics and biosimilars is important, because one thing we know is that competition is the key that drives lower prices in the generic marketplace.7 The hope, of course, is that eventually biosimilars will come to play a similarly important role in keeping biologic drug prices down. But first, the marketplace has to make sense for the manufacturers, either generics or biosimilars. BPCIA is undoubtedly a more complex pathway for biosimilars than the traditional generic approval process.4 Nevertheless, the process does seem to be working in its important respects. While technical hurdles and regulatory uncertainty are undoubtedly part of the reason for the delay in the approval of biosimilars, our limited experience to date raises the possibility that actually, patent challenges may play a larger role than many of us expected. Perhaps the best way to understand how this may play out is to take a closer look at the way patent expiration is working for two of 2016’s biggest-selling expirations: Crestor and Humira. However, after that very brief pause, there are at least ten different generic manufacturers who have received tentative FDA approval to make a generic for Crestor.12 While we can’t know the exact timeframe now, such a large number of prospective competitors have analysts predicting a classic example of market share loss for Crestor when its patent expires. Experts predict that, once all of the competitors enter the market, U.S. revenues for Crestor are likely to drop by 90% within 12 months.13 In other words, the classic downward roller-coaster. How can this be? The basic explanation appears to lie in the sheer number and complexity of patents that can apply to various aspects of modern biological drugs. 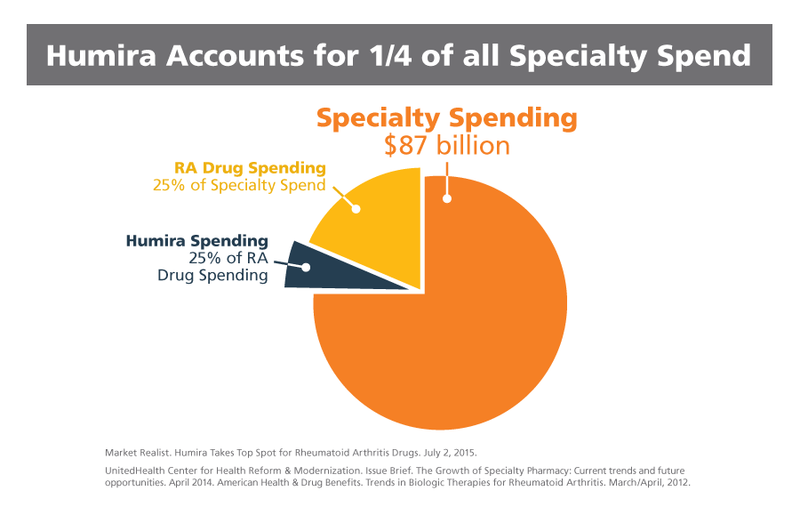 AbbVie Inc. depends on Humira for over 60% of its total revenue.17 In order to protect this revenue stream, they have developed several lines of defense which they believe will protect their exclusive protection period for many more years. The size of AbbVie's patent estate is a direct consequence of the groundbreaking work of AbbVie's scientists in the new field of biologics. […] Because they must be made in living organisms, biologics are more difficult to manufacture. In addition, because they are foreign proteins that are introduced into the human body, biologics present unique challenges in terms of formulation and treatment. 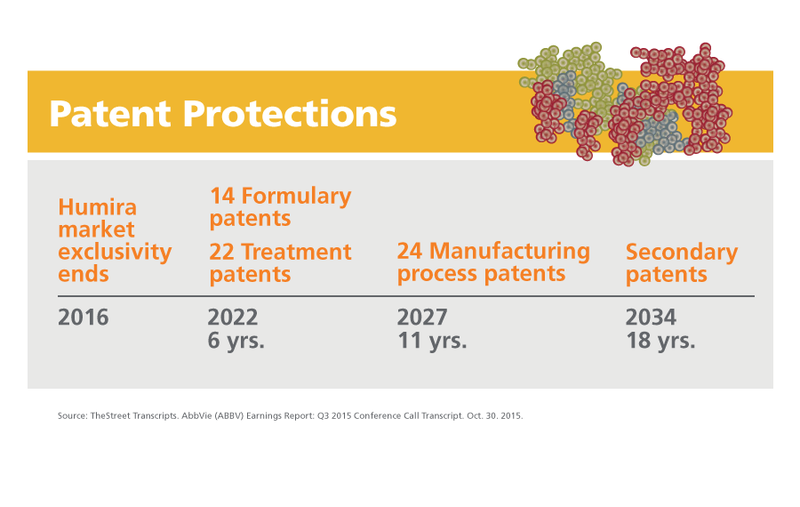 Knowing this makes AbbVie’s prediction of continued market exclusivity until 2022 begin to look rather reasonable. Of course we can’t know how the majority of biologic drug makers will proceed as their own drugs reach the end of their market exclusivity. Some, or even most may choose to adopt the AbbVie approach and fight for every minute of every patent. Or, perhaps the regulatory powers will intervene. Our concluding part of this series will explore some of these alternatives and in particular, will look at the implications of continued, extended patent litigation. There is a real possibility that widespread use of the patent law in this way could affect the financial incentive structure that drives the follow-on drug market in such a way as to make it infeasible to pursue biosimilars altogether. PharmExec.com. Patent Strategy Implications in the Biosimilars Space. Apr 11, 2015. Accessed at: http://www.pharmexec.com/patent-strategy-implications-biosimilars-space on 02.29.2016. The Economist. Going Large. Jan. 3, 2015. Accessed at: http://www.economist.com/news/business/21637387-wave-new-medicines-known-biologics-will-be-good-drugmakers-may-not-be-so-good on 02.15.2016. Biotechnology Innovation Organization. How do Drugs and Biologics Differ? Oct. 11, 2010. Accessed at: https://www.bio.org/articles/how-do-drugs-and-biologics-differ on 03.10.2016. Congressional Research Service. Follow-On Biologics: The Law and Intellectual Property Issues. Jan. 15, 2014. Accessed at: https://www.fas.org/sgp/crs/misc/R41483.pdf on 03.24.2016. FiercePharma. AstraZeneca zaps another Crestor generic threat with Actavis settlement. March 25, 2013. Accessed at: http://www.fiercepharma.com/story/astrazeneca-zaps-another-crestor-generic-threat-actavis-settlement/2013-03-25 on 03.24.2016. Statement before Senate Committee on Health, Education, Labor and Pensions (HELP), Congress of the United States. Why Are Some Generic Drugs Skyrocketing in Price? November 20, 2014.Aaron S. Kesselheim, Associate Professor of Medicine, Harvard Medical School, Director, Program On Regulation, Therapeutics, And Law (PORTAL), Division of Pharmacoepidemiology and Pharmacoeconomics, Brigham and Women’s Hospital, Boston, MA. Accessed at: http://www.help.senate.gov/hearings/hearing/?id=a7beb0ef-5056-a032-521e-c63f76dda7f3 on 11.18.2014. Statement before Senate Committee on Health, Education, Labor and Pensions (HELP), Congress of the United States. Why Are Some Generic Drugs Skyrocketing in Price? November 20, 2014.Stephen W. Schondelmeyer, Professor and Head Department of Pharmaceutical Care & Health Systems, College of Pharmacy, University of Minnesota. Accessed at: http://www.help.senate.gov/hearings/hearing/?id=a7beb0ef-5056-a032-521e-c63f76dda7f3 on 03.09.2016. FDA News Release. FDA approves first biosimilar product Zarxio. March 6, 2015. Accessed at: http://www.fda.gov/NewsEvents/Newsroom/PressAnnouncements/ucm436648.htm on 03.21.2016. FDA News Release. FDA approves Inflectra, a biosimilar to Remicade. April 5, 2016. Accessed at: http://www.fda.gov/NewsEvents/Newsroom/PressAnnouncements/ucm494227.htm on 04.15.2016. Medical Marketing & Media. Competition drives down sales of J&J's Olysio. April 19, 2016. Accessed at: http://www.mmm-online.com/corporate/competition-drives-down-sales-of-jjs-olysio/article/490802/ on 04.20.2016. Biopharma Reporter. Zarxio one year on: US biosimilars market still riddled with uncertainty, expert. March 9, 2016. Accessed at: http://www.biopharma-reporter.com/Markets-Regulations/Zarxio-one-year-on-Questions-remain-around-US-biosimilar-market on 03.21.2016. FDA/Center for Drug Evaluation and Research /Drugs@FDA. ROSUVASTATIN CALCIUM. Accessed at: http://www.accessdata.fda.gov/scripts/cder/drugsatfda/index.cfm?fuseaction=Search.Overview&DrugName=ROSUVASTATIN%20CALCIUM on 03.04.2016. Forbes. Patent Expirations Of Crestor And Zetia And The Impact On Other Cholesterol Drugs. Jan 18, 2016. Accessed at: http://www.forbes.com/sites/johnlamattina/2016/01/18/patent-expirations-of-crestor-and-zetia-and-the-impact-on-other-cholesterol-drugs/#229abd5c5c59 on 02.18.2016. Generics and Biosimilars Initiative (GaBI). Biosimilars of adalimumab. Last update: Nov 13 2015. Accessed at: http://gabionline.net/Biosimilars/General/Biosimilars-of-adalimumab on 02.24.2016. PRNewswire. FDA Accepts Amgen's Biosimilar Biologics License Application For ABP 501. Jan. 25, 2016. Accessed at: http://www.prnewswire.com/news-releases/fda-accepts-amgens-biosimilar-biologics-license-application-for-abp-501-300209337.html on 03.07.2016. BioPharma Reporter. AbbVie: Humira’s patent maze will keep US biosimilars away until at least 2022. Nov 3, 2015. Accessed at: http://www.biopharma-reporter.com/Markets-Regulations/AbbVie-Humira-s-patent-maze-to-keep-US-biosimilars-at-bay-until-2022 on 02.24.2016. Bidness Etc. Why AbbVie was not Impacted by Amgen Humira Biosimilar Submission. Nov 30, 2015. Accessed at: http://www.bidnessetc.com/58311-why-abbvie-was-not-impacted-by-amgen-humira-biosimilar-submission/ on 02.19.2016. TheStreet Transcripts. AbbVie (ABBV) Earnings Report: Q3 2015 Conference Call Transcript. Oct. 30. 2015. Accessed at: http://www.thestreet.com/story/13346337/6/abbvie-abbv-earnings-report-q3-2015-conference-call-transcript.html on 04.15.2016. This article is directed solely to its intended audience about important developments affecting the pharmacy benefits business. It is not intended to promote the use of any drug mentioned in the article and neither the author nor OptumRx has accepted any form of compensation for the preparation or distribution of this article.